We’re big fans of BenQ’s home projectors but it’s really surpassed itself with the W2700. It’s a true TV-replacing projector, delivering pin-sharp 4K UHD images with HDR Pro contrast and brightness to a maximum screen of 200 inches that dwarfs even the most high-end TV. However the real story here is about colour. Colour is the most important element to any film (or a least practically all films made during our lifetimes). Colour is what burns into your memory, whether it’s the yellow brick road, or the sci-fi explosions of colour found in Kubrick’s Space Odyssey or Pixar’s Wall-E, or the tinted colour palettes of Spielberg’s 2000s classics such as Minority Report and War of the Worlds. Or coming right up to date with the colour-saturated likes of Disney’s MCU – Avengers, Dr Strange and Black Panther. BenQ’s Home Cinema projectors are built to convey colours as the director intended, using a system it calls CinematicColour, to summon up the deepest feelings in you, the viewer. That’s not just an emotional statement, it involves a lot of hard work on the tech in BenQ projectors, such as the flagship W2700. The W2700 is a 4K UHD HDR (high dynamic range) projector – these are all terms you’ll be well familiar with if you’re a regular visitor to T3. It also boasts a wide colour gamut – showing off as many tones as possible, to bring you more of the director’s vision, whether that’s a Hollywood great on Blu-ray or the latest Netflix Original. No projector technology can reproduce every colour perceivable by the human eye, but BenQ is working to provide as many as possible. If you’ve used projectors in the past you’ll no doubt have been blown away by the sheer size of image they can throw up, but you’ll also have noticed a lot of oversaturated greens and reds, or weird tints. BenQ does away with that on the W2700 with Enhanced Colour Mapping. This combines innovative technologies in light sourcing, lenses, colour wheels, tone mapping and colour calibration to muster up precise, lifelike colours in 4K, from natural skin tones, to the most vivid colours in CGI animations and super-hero blockbusters. BenQ projectors summon that emotion, sparking joy in viewers with true, accurate colours. If you’re serious about movies, you owe it to yourself to check the W2700 out. 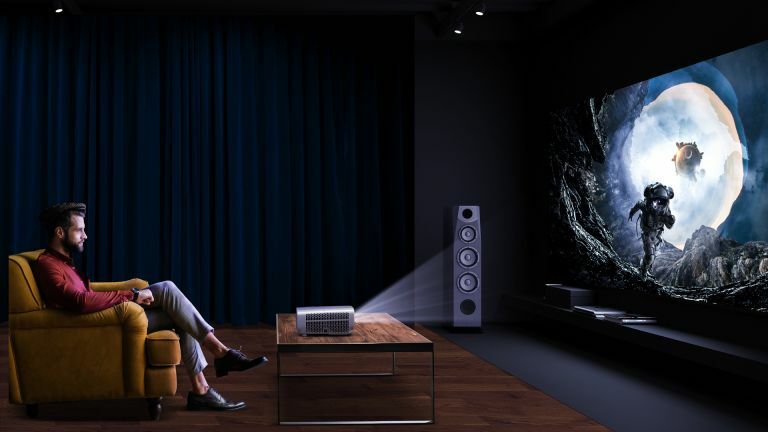 If you’re a true cinephile, with a dedicated home theatre room (or, at least, a room that is habitually darkened), you could really treat yourself with the W5700. This takes the core CinematicColor tech found in the W2700 and pumps it up. So here, the true 4K video has an even wider colour gamut (100% of the DCI-P3/Rec.709 colour space, if you want to get technical about it – see ‘the science bit’ below). • BenQ projectors use leading light source technology with a strict waveform analysis to ensure that the colour temperature of the projected light accurately reproduces the correct colour in the gamut. • The high precision, six-segment RGBRGB colour wheel is made under stringent quality control to nail a perfect balance between colour accuracy and brightness. Precise, nanometer-level references test over 20 combinations of colour wheel angles and coatings to meet the colour gamut requirements to reproduce true Hollywood colour. • Each CinematicColour projector is tested and adjusted. BenQ is the industry’s only home projector brand to adopt such high standards of colour calibration to ensure colour is continually reproduced accurately. • CinematicColour tech means the BenQ W2700 achieves 95% of the DCI-P3 colour gamut. Putting it as simply as possible, DCI-P3 maps the full range of colours that digital projectors used in cinemas can muster up. Even more impressive, the W5700 can manage 100% of that colour range. Armed with 6K cameras, we risked life and limb to film the stunning storms of middle America in glorious HDR. Want to buy a gaming PC but don’t know where to start? Here are the basics.